Chico, CA — Eventide Visuals, Inc has launched it’s second trailer and Kickstarter campaign for “Fight for Space” a feature length documentary film that explores the economic and cultural benefits of human space exploration, as well as the historical and political events that have led to the decline of human spaceflight activities and NASA’s struggle to return to the Moon and send humans to Mars. 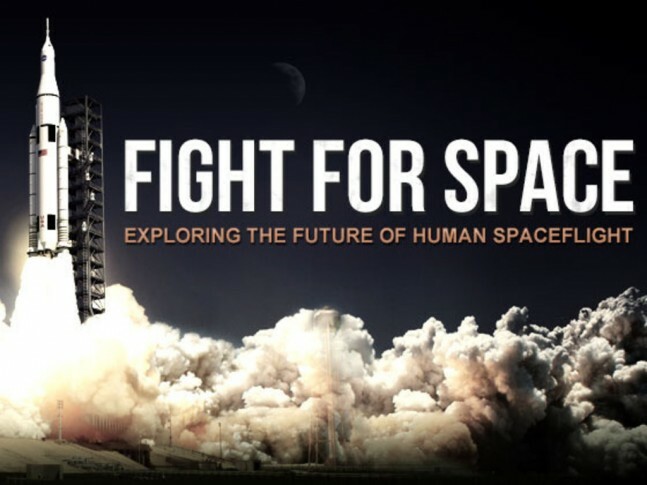 Fight for Space presents viewpoints from NASA astronauts, politicians and staff, scientists, former NASA officials, commercial space entrepreneurs, and many other individuals in the space community. Some examples include Jim Lovell, Gene Kranz, Story Musgrave, Bill Nye, Neil DeGrasse Tyson, Michio Kaku, Rep. Dana Rohrabacher, Rep. Donna Edwards, Lori Garver, Jeff Bingham, Rick Tumlinson, Jim Muncy, John Logsdon, Jeff Greason, Mark Sirangelo, Marcia S. Smith, Robert Zubrin, and Dennis Wingo. Using Kickstarter a crowd funding website, Eventide Visuals is seeking to raise an urgently needed $80,000 to complete post production on the film and release it this year. The film aims to have limited theatrical screenings around the country, be distributed digitally, and be ready for public television broadcast later this year. Editing on the film is nearly complete, and funds are needed for the musical score composer and recording, national archives film transfers, and additional technical mixing of the film for theatrical and broadcast release. Fight for Space advocates for the advancement of space exploration by showing the benefits of space exploration at a governmental, cultural, and commercial level. Since the Apollo program, NASA’s budget has been shrinking along with it’s ability to complete ambitious goals. Fight for Space will look at why and how the space program came adrift, and will examine future plans from NASA and commercial entities. Space advocates are encouraged to support the film in exchange for which they can receive items such as digital copy of the film, DVD or Blu-Ray, film poster, t-shirt, and more. Visit the FIGHT FOR SPACE Kickstarter Page to support the film. In 2012, Eventide Visuals successfully raised funding on Kickstarter to start the first phase of the Fight for Space film production. This finishing funds campaign will allow the completion and distribution of the film. And I thought that there’s more than enough documentaries about US space program. I would gladly support one about European, Chinese, Japanese or even Indian space program, but US? Again? No, thank you.